Border Lines: Rick Perry's Border Populism Betrays His Love of "Big Government"
Rick Perry's Border Populism Betrays His Love of "Big Government"
For Perry, like most right-wing populists, big government is bad government when it regulates and redistributes. Yet when government enforces, when it secures, the more government the better. When our tax revenues support the new security trinity -- border security, homeland security, and national security – Perry is a professed and proven advocate of big government. Nor will you find Rick Perry criticizing big government when it involves funding cracking down on crime and drugs. In Texas, state government has expanded into new dimensions and grown new tentacles. In the name of border security, Perry has overseen the creation of an array of new fusion centers, intelligence centers, drug task forces, and criminal data exchanges in Texas. In Washington, there isn’t a more pertinent example of big government expansion than the creation of the Department of Homeland Security, with its annual budget of $55 billion. During Perry’s tenure as governor, the DHS budgets for border control and immigration enforcement have more than doubled. There is no other Washington bureaucracy that has a greater presence in Texas. In his campaign book, Fed Up! Our Fight to Save America from Washington, Perry does take aim at DHS, writing that “we are fed up with the Department of Homeland Security.” But not because of undue government meddling, waste of tax dollars, or infringement of states’ rights. Instead, Perry is fed up with DHS because this huge government bureaucracy is not doing more and doesn’t have a greater presence in Texas. Despite the more than doubling of DHS border security operations in Texas since 2005, Perry complains that Washington’s financial commitment to border security in Texas is “puny.” He demands that President Obama commit “greater resources” to border security – without offering any advice about how to raise those additional resources. When President Obama authorized federal payment for the deployment of 286 National Guard troops on the Texas border, Perry demanded a thousand troops. When President Obama announced last year that DHS would hire 1,000 more Border Patrol officers, Perry immediately countered, demanding at least 3,000 new patrol agents. During Perry’s first several years as governor (after, as lieutenant governor, succeeding George W. Bush in 2001), border security was barely mentioned. However, as the anti-immigrant backlash mounted and as the calls for enforcement-first and border security-first intensified as part of the immigration reform debate, Governor Perry also jumped on the border security bandwagon. Lately, the governor has also brought national security into the equation. In an August 10, 2010 letter to President Obama, Governor Perry warned that U.S. national security is at risk. He warned: “An unsecured border is a threat to our national security and to the safety and security of all our citizens.” In press releases and media interviews, Perry regularly calls for the deployment of Predator drones to combat drug trafficking organizations and transnational gangs in the Texas-Mexico borderlands, claiming that U.S. national security is threatened by the crossborder flow of drugs and criminal aliens. "Without that strong economy, America can't be strong militarily. We can't have, frankly, a presence in the world that we need to have," Perry told Time magazine as he was about to launch his presidential campaign. So grave is the drug and criminal alien threat from Mexico, says Perry, that Washington should consider military intervention. In a Nov. 18, 2010 interview with MSNBC’s Chuck Todd, Perry said: "I think we have to use every aspect of law enforcement that we have including the military. I think we have the same situation as we had in Colombia. Obviously Mexico has to approve any type of assistance that we can give them." Some observers may regard Perry’s support for expanded government involvement in security, crime, and drug war operations as running counter to his anti-Washington, anti-big government political philosophy. Perry skirts this apparent contradiction with messaging that blames and scapegoats Washington for the purported lack of border security. Bad big government is the problem is the message that he effectively communicates to his prospective constituencies. By asserting the right and need of Texans to take border security into their own hands, Perry has also astutely converted border security into a populist principle that also meshes well with the “states’ rights” convictions of many right-wing populists. Rick Perry has earned the reputation as a shrewd, highly effective political operator, and his ownership of the border security issue in Texas amply demonstrates his political smarts. Perry has made himself the top border hawk in Texas and arguably in the nation. Arizona Republican sheriffs and legislators, with Governor Brewer following their lead, have lately gained more national attention for their hawkish border and immigration policies. But if any credit is due for making border security a wedge political issue to challenge the Democrats and President Obama, it must go to the rural border sheriffs in Texas, along with the governor and his homeland security chief, Steven McCraw. Although a local initiative, the sheriffs coalition and its Operation Linebacker are also products of big government. No local or state resources were used to launch these border security efforts. From the start, annual earmarks by the Texas congressional delegation, mostly by Senator John Cornyn, provided the core financing for the sheriffs coalition and Operation Linebacker. Without the $4-5 million in annual earmark funding and other criminal justice assistance grants from the Justice Department, there likely would be no Texas border sheriffs coalition. The coalition’s colorful, outspoken leaders, including Sheriff West and coalition founder Sheriff Siggy Gonzalez of Zapata County, soon began making national news and earning spots in congressional hearings with their alarming assessments of border security and their contention that U.S. security depended primarily on their underfunded, poorly armed deputies. “We’re the nation’s first line of defense,” Sheriff Gonzalez told me. The Texas border sheriffs pointed the way for Arizona to make border security a winning political issue. The Texas sheriffs did this – with Perry at their side in his televised campaign ads and public appearances – by painting a scenario of poorly armed, besieged deputies protecting America’s frontline while big government in Washington dithered. 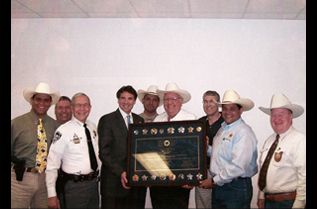 In the classical pattern of right wing populism, the sheriffs coalition leaders together with Governor Perry and Homeland Security/DPS chief McCraw attracted national attention and strong state support with their fearmongering and scapegoating. What proved so politically astute about the Texas model was its deliberate avoidance (for the most part) of blatant anti-immigrant and anti-immigration rhetoric. What was to fear were not illegal immigrants – a term rarely used in the Texas model – but “criminal aliens,” “transnational gangs,” and the intrusions of Mexican drug cartels on Texas soil. The tales of Muslim “sleeper cells,” penetration of Los Zetas operatives, alarming outbreaks of crime and violence in the Texas borderlands, and the refusal of the Border Patrol to engage armed intruders were credible by virtue of the shiny badges of the sheriffs and their grassroots, tell-it-like-it is manner. Fox News loved it, and so did the legions of Perry supporters eager to bash Washington for being soft on border security. Border Star became the umbrella border security project not only for Operation Linebacker but also for a dizzying array of other initiatives, including a series of individually named “high-intensity border surges”, including Operation Rio Grande and Operation Wrangler, which brought together the border sheriffs with the Department of Public Safety’s (DPS) state police and its Texas Rangers. Perry also established a Border Security Operations Center in Austin to coordinate a half-dozen Joint Operation Intelligence Centers along the Texas border. The Border Star model of border security is a shape-shifting creation, as the governor and McCraw keep adding new components without bother to report the performance of previously announced dimensions of the model. Other parts of the loosely constructed Border Star model are the state’s Border Intelligence Information Network, a border Unified Command, TX Crime Mapping project, and, most recently, the Ranger ReCon missions. In the last couple of years, Arizona has created its own lesser version of the Texas model. Like in Texas, right-wing rural sheriffs – Sheriff Larry Dever of Cochise County and Sheriff Paul Babeu of Pinal County – formed the vanguard of the state’s border hawk forces, forming their own organization called BorderSheriffs.com to raise funds to defend their border and immigration enforcement operations from possible legal challenges by the ACLU and the Justice Department. Like in Texas, the Arizona model border includes border control operations mounted by border sheriffs and supported by the governor’s office. But the Arizona model deviates in its more assertively anti-immigrant strategy – notably the SB 1070 immigration enforcement law – and its support for the border wall (which is less well regarded in Texas, even among border hawks). The Texas model has a political sophistication lacking in Arizona’s “Secure the Border” campaign and which makes it more readily adaptable to the national political campaigning by Perry. The “Secure the Border” campaign mantra of John McCain and the anti-immigrant antics of the Arizona border sheriffs, Republican legislators, and governor have marked Arizona in the national consciousness as standing in the forefront of the border security and immigration backlash. But the more measured and strategic border security politics of Texas have since 2005 served as the true vanguard of America’s border hawk forces. What proved so politically astute about the Texas model – at least in Texas -- has been its deliberate avoidance (for the most part) of blatant anti-immigrant and anti-immigration rhetoric. What is to fear are not illegal immigrants – a term rarely used in the Texas model – but “criminal aliens,” “transnational gangs,” and the intrusions of Mexican drug cartels on Texas soil. The “Don’t Mess with Texas” spirit of the Texas border security model was something all Texans, including Latinos and immigrants, could share. Faith, freedom, and free enterprise are the first principles that unite conservatives in the Republican Party. But coursing through the right-wing base are less noble sentiments like nativism and nationalism – commonly taking the form of immigrant scapegoating -- that the party has struggled to contain and manage. In the aftermath of the terrorist attacks of 9/11 and rise of the homeland security complex, the country’s nativists, nationalists, and immigration restrictionists have risen to the forefront of the populist backlash movement. No doubt that shrill anti-immigrant positions ring true among the tea party base. But to win the general election, Republicans can’t afford to completely write off the votes of Latinos and others who may be offended by such borderline racist rhetoric. The staunch immigration restrictionists, as represented by the Beltway restrictionist institutes – Center for Immigration Studies, Numbers USA, and Federation for American Immigration Reform – fret that anti-immigration, anti-immigrant stance of the right wing populists may be sidelined by a candidate like Rick Perry who has less restrictive position on immigration. The central challenge for the Republican Party is to field a slate that can count on the support of the base while at the same time win over the independents and disenchanted in enough blue and contested states to defeat Obama. Try as he may, Mitch Romney will never be regarded as the standard bearer of the right wing resurgence, although he may better positioned to reach beyond the ideological confines of the party. Rick Perry came to politics not as an ideological conservative or right-wing populist but as conservative Democrat and social conservative. Over the years he has moved steadily to the right, and in recent years embraced the economic libertarianism and states’ rights positions that resonate within the right wing resurgence. While his social conservativsm and libertarianism have certainly factored in his electoral victories, it has been his ownership of the border security issue that ensured his 2010 primary victory over Kay Bailey Hutchinson. In the election campaign, President Obama will surely also tout his commitment to border security. But in a face-off with the Texas governor, the president would be hard put to convince voters that he is as tough on border security as Perry. What is more, Obama will, unlike Perry, be burdened by his administration’s immigration enforcement and border security accomplishments – three years of record-breaking deportations and immigrant imprisonment. While not beloved by Texas Latinos, Perry did capture 39 percent of the Latino vote in 2010 gubernatorial contest. The governor’s past statements in favor of a guestworker program and in-state tuition rates for immigrant students as well his opposition to an Arizona-style immigration enforcement law would, in an Obama-Perry election, also contribute to an erosion of Latino support for Obama. Rather than scagegoating immigrants, as has been the usual practice of border hawks and immigration restrictionists, Texas border security populism cast the blame on Washington, on big government, and, more vehemently over the past three years, on the Obama administration. Perry can boast that he is not the type of American that turns first to big government. Instead he has empowered sheriffs’ posses through Operation Linebacker, tapped the expertise of the private sector with homeland security consultants, sent Texas Rangers on the border in Ranger Recon mission, and mobilized thousands of citizen activists through the Border Watch surveillance program. Washington certainly deserves much blame for the border control crisis. But the Texas scapegoating of the Obama administration aims to stir popular resentments and heighten feelings of vulnerability, not to address the real problems of the border. The Obama administration has committed unprecedented resources to border and immigration enforcement. What it is not doing taking the necessary measures to decrease the pressure on the border by overhauling drug prohibition policies and immigration law. Rick Perry is a true hpocrite. Texas politicians going all the way back to former governor, former President George Bush, Texas has turned a blind eye to illegal imigration. WHY? Because Texas thrieves on the cheap labor Mexican and Central America brings into Texas. They work in our factories, home building and construction trades. Illegal imigrant labor one might say have allowed Texas to have cheaper housing.REGULATIONS ? Rick Perry , Greg Abbott , George Bush have lambasted the federal government to stay out of Texas affairs. EPA get out! BLM get out ! Texas knows how to run it's own affairs. Yet they lambast Obama for all the lack of immigration reform yet the Republicans have fought every effort of the Obama administration to move forward on ANY reforms. NOW because we have thousands of children illegally entering our country it is blame Obama again. 24 years of Bush /Perry rule in Texas and not much asked for controls on immigration or protecting Texas borders.